Harvests early in summer - stores into mid-winter. Italian White is an excellent early season garlic with a deep rich flavor to it but only a little bite. It has long been an Italian gardener's favorite because it is an early harvesting, richly flavored light-to medium pungency garlic that grows almost anywhere. In addition, its parchment-like bulb wrappers make it a very good braiding garlic. 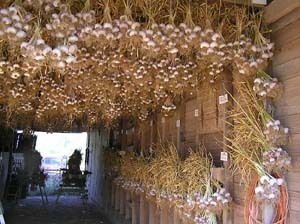 That's a lot to like in a garlic that when properly grown and stored will keep through the winter and it is a prolific grower and a good commercial garlic. It matures after the mild Red Toch and about the same time as Inchelium Red, which is a little stronger most years. It grows well in warm winter areas and is quite hardy. Italian White ranks 6-8 on the garlickiness scale and 3-4 on the pungency side. It has a rather rich, musky, earthy flavor and a little bite, but is still on the light side. Italian White is similar to Siciliano and is an excellent early season braider for northern gardeners - they mature a month or two before the Silverskins. It's a very good grower's garlic as it has many large cloves (even the innermost cloves are of good size) and it stores well under proper conditions. NOTE: Know where your food comes from - Buy Italian White direct from the growers below. Sorry, sold out for 2018.